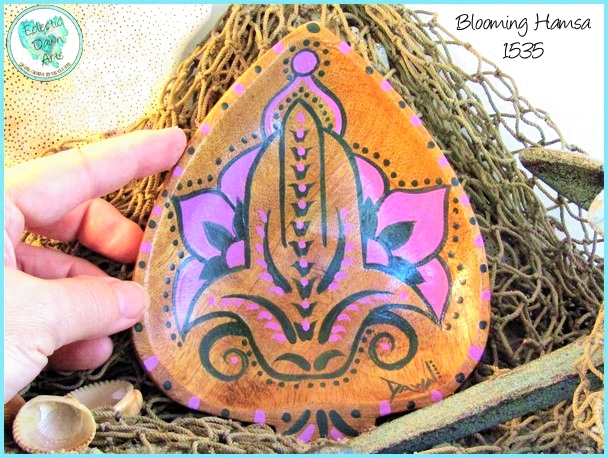 SOLD -TB1537 'Blooming Hamsa' - SIZE: 5 x 6 inch - This gently-used monkeypod tray is adorned with a freshly-painted hamsa hand with leaves, vines, and purple flowers. The hamsa hand is used in many cultures in the hopes of warding off the evil eye. 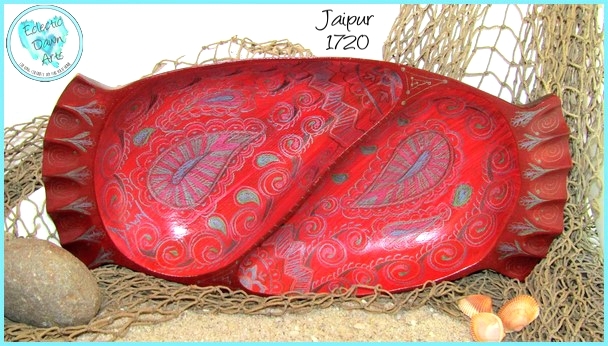 #TB1720 : 'Jaipur' Trinket Tray or Decorative Bowl (accessories not included). 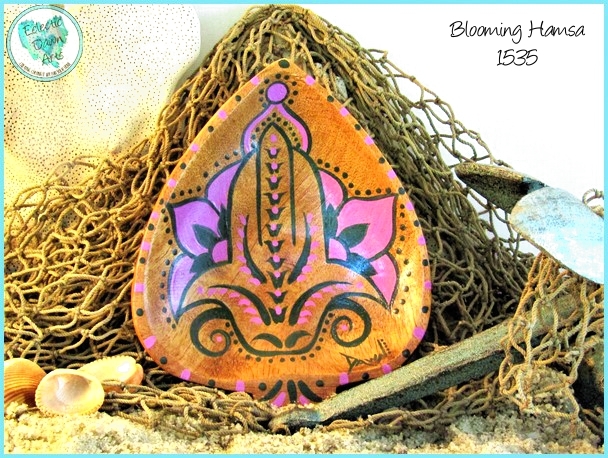 ~15 x 7 inch two-section tray (sizes are approximate due to the organic shapes). A hand-drawn henna design over a painted red background on a 15" two-section tray will remind you of incense and exotic flowers. 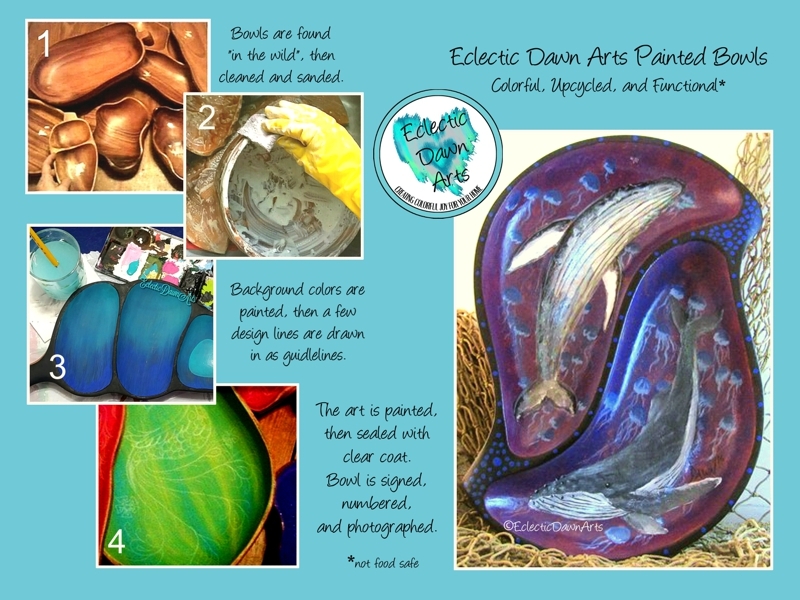 Bring this burst of color to your home, or give it as a gift to someone special! Free shipping. Not food safe, clean with damp cloth, do not put in dishwasher. 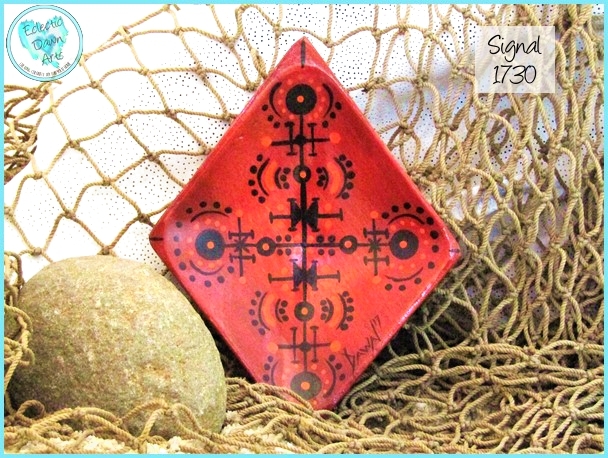 #TB1730: 'Signal' mini trinket tray/shallow decorative bowl (accessories not included). ~5 x 4 inch diamond shape (sizes are approximate). 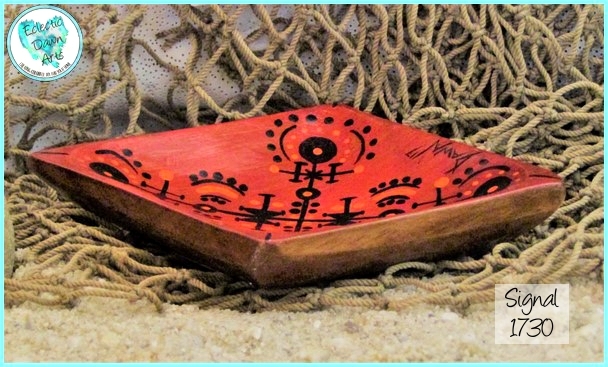 This diminutive wood tray is painted with an abstract line and dot design. There is definitely a Bedouin design influence to this piece, but it also looks like it could be something right out of the mid-century atomic era, when Etruscan horses were all the rage! Either way, it is an intriguing piece that will catch the eye no matter where you place it. It makes an unusual ring keeper and a certain conversation starter! Free shipping. Not food safe, clean with damp cloth, do not put in dishwasher. 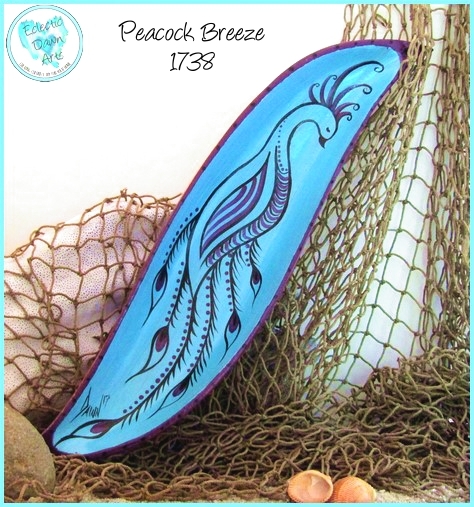 #TB1738 : 'Peacock Breeze' bowl, approx. 15 x 3.25 inch (accessories not included). A brilliant aqua blue background sets off an elegant henna style peacock in purple and black. What a lovely accent piece for your home, a gift for your best friend "just because", or a place to set your favorite necklace at the end of the day. Free shipping. Not food safe, clean with damp cloth, do not put in dishwasher. 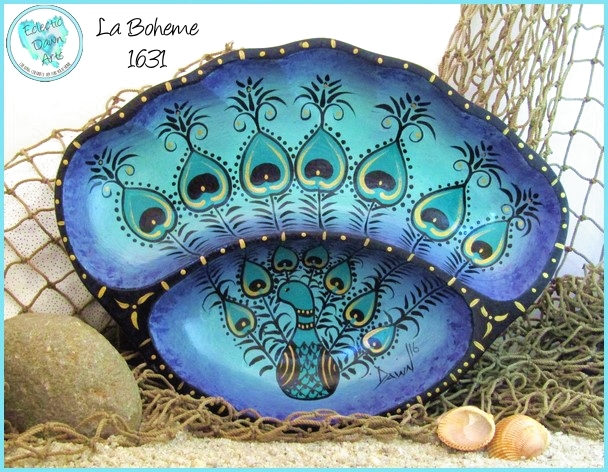 #1631 : "La Boheme" (accessories not included), ~9 1/4' x 7 1/4" (size approximate) This opulent peacock is painted in the style of ancient henna patterns in beautiful tones of purple, mint, teal, black, and metallic gold. 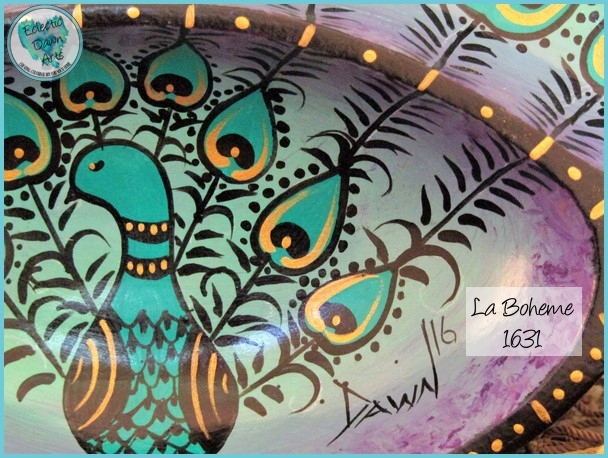 A fantastic gift for the person with eclectic, exotic, or boho tastes, peacock art is a great wedding or housewarming gift due to the symbolism of prosperity and longevity.